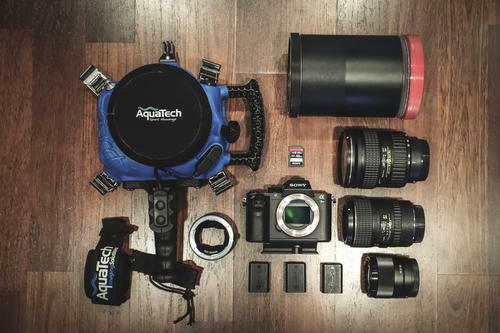 In the increasingly popular realm of surf photography, an Action Cam is ideal for getting up close and personal, but if your goal is to get a little more artistic and experiment with a variety of focal lengths and perspectives, you’re going to want to move to a different kind of setup. Southern California surf photographer Stan Moniz is among the best at this kind of photography. Moniz goes beyond radical action and shows the waves, the coastline and the special light that only happens on the water. He brings art to the surf. Here’s the gear he uses to do it. Lens Ports: Aquatech P-190 - designed for use with my telephoto zoom lenses. Aquatech P-65 - designed for use with my short to medium focal length prime lenses. Lenses: Sony FE 28mm f/2.0 - I'm a huge fan of small light weight primes that can pack a punch! If I'm in the thick of things in the pounding surf and in no need for extra reach in focal length, the 28mm is the first choice on my list. It's light in weight, sharp and very fast to focus. I use the Aquatech P-65 port for this lens. Tokina 24-70 - My all-around lens. From composing a line up shot in the water from the safety of the channel to being right on top of things. Attached to the Sony α7R II via a Metabones adapter. The perfect focal length for everyday water men. I use the P-190 Aquatech port for this lens. Tokina 100mm Macro - Being a smallish, pretty lightweight 100mm macro, it opens a whole new world of artistry of surf photography. I take this lens out quite often when the waves are smaller and especially, early in the morning when I get that first light. I tend to open the lens all the way up to f/2.8 and focus very closely on the calm and reflective surfaces of a breaking wave. This lens will pick up each and every detail of moving water, producing a dreamy look. I use the Aquatech P-190 port for this lens. Other Gear: Metabones Mark IV adapter, Sony 128GB SDXC memory card, 3 extra batteries.